all these blog posts bragging about how great their pull buoys are, and emails trying to convince me to buy a certain other pull buoy, ha! well it has brought me out of my swine flu-induced blogging stupor because Beck needs to see the creation that is the patented Wongstar Pull Buoy. Sorry, but the blog post about Mac’s farm will have to wait again, this one is much long overdue. 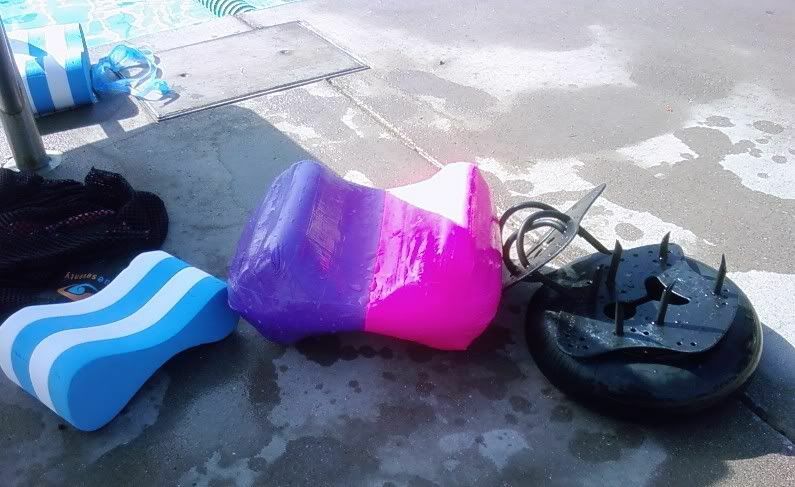 Because you see Beck, the attempt at copying your pull buoy was not a complete failure as it was deemed salvageable and still better in its semi-deteriorated state than the piece o’ crap pull buoy I once had…for the piece o’ crap swimmer I once was…oh wait a sec…never mind. So the story begins in the original rookie camp during October of yesteryear, when Miss Beck Preston shows up to camp a few weeks after the rest of us. 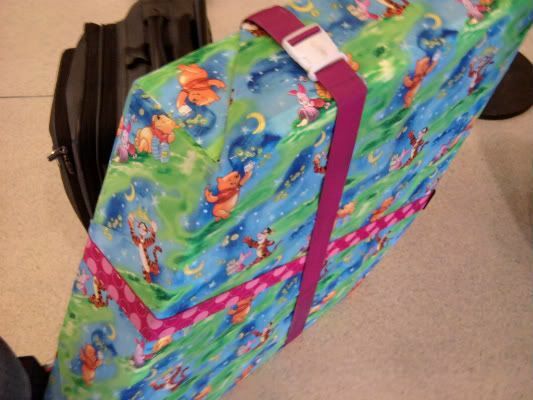 The airline had lost some of her luggage and she was most frantically concerned about… a… well, a pull buoy. !!! Yeah, my reaction exactly. “OOOO-kay…What could be so great about a pull buoy? 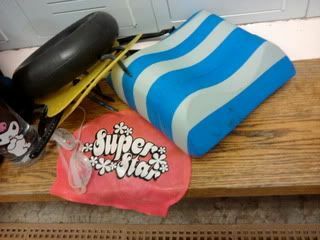 !” Luckily the luggage was found and Beck’s pull buoy was the strangest little alien pull buoy I had ever seen. It was shaped like a friggin’ SQUARE. And she LOVED it. You could tell. One day at the pool Coach insisted I try it on. I was very skeptical. And then….OH! I wanted my own! I searched high and low on the internet and Beck said these must have gone obselete 20 years ago. 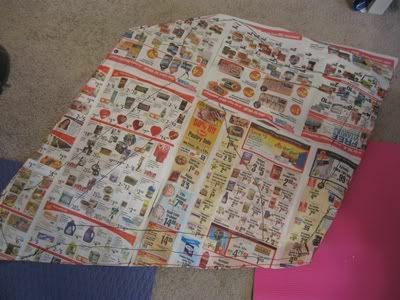 There was/is nothing sold in the States that even resembles a “Beck’s Pull Buoy.” So like most things that are hard to find, too expensive, or don’t exist yet, I decided to channel my inner MacGyver and well, make my own. Apparently making things runs deep in the Wongstar bloodline. My dad is an engineer and my mom majored in fashion design. She made her own wedding dress and all our Halloween costumes. (Ok, she still makes us Halloween costumes and they are FABULOUS.) And oh yeah, I do make prosthetic legs for a living, so a pull buoy? 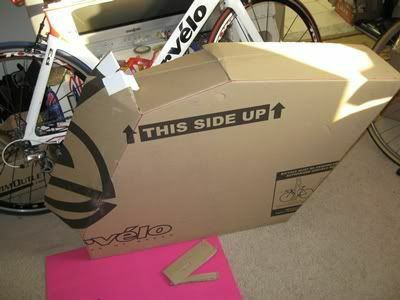 a bike box? easy cheesy. 1) Get Beck to email you her pull buoy dimensions and some pictures from different angles. 2) Buy a big sheet of styrofoam from Home Depot for $6. They call it “insulation foam.” for insulating buildings or something. 3) Cut 2 square-shaped pieces. The sheet only came in a 2″ thickness so I figured I would glue them together when all was said and done. The cutting part would be easiest with a jigsaw; well, I don’t own one so I asked “WWMD?” What would MacGyver do? He would use whatever was in his garage and kitchen. Well, no, he would probably use the Swiss army knife in his pocket and his bare teeth. 4) Take your Styrofoam squares to work and glue them together. Luckily your boss warns you just in time that solvent-based glues might dissolve Styrofoam, so you better test it first. And he’s right! The website that says spray adhesive would work was lying. 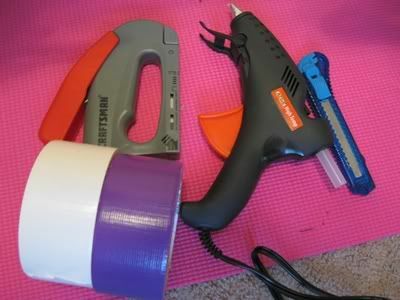 Elmer’s Glue is water-based and seems to work. Phew. 5) Use the Trautman in the lab to shape the block into the pull buoy design outline you have drawn on the edges with Sharpie. The Trautman is a carver you can attach different size and shape sanding cones to when making things…like prosthetic legs. Or pull buoys. Don’t have a Trautman at your work? Well, ask WWMD? 5) Know you are done with the shaping process when your boss yells at you for tracking Styrofoam all over the office. eeeep. Ok, I’m done with being a perfectionist for now. 6) Time to test out the pull buoy after work. It’s great!! What an effing genius you are!!! …1 hour into the workout, you experience a weird rubbing between the legs. And you realize the funny thing about water-based glues is that they dissolve when put in water. Oh quandary! 7) At this point, if you really were an effing genius like MacGyver, you would’ve just duct-taped the two pieces together and called it a victory. But we can all only hope to aspire to such greatness. Instead, read on if you want to follow the Wongstar’s pitiful and unworthy path to potential greatness….which is at least twice the steps MacGyver would’ve taken. <–that was supposed to be step #8 but turned into the smiley sunglasses guy. LOL! good to know… Ok. HMM. I’m going to combine many steps into one so I don’t seem as idiotic as I am, but I basically had the quandary, how do you water-proof a pull buoy to protect the water-based glue holding it together? A string of misinformation and mistakes followed, climaxing with a Home Depot guy telling me that spraying it with wood lacquer finish would definitely waterproof it, and it wouldn’t dissolve if I painted it with a water-based latex paint. I was skeptical, but I had also been skeptical about how great Beck’s pull buoy would feel…so…. AUGHHH!!!! FAIL FAIL FAIL FAIL FAIL!!!!! 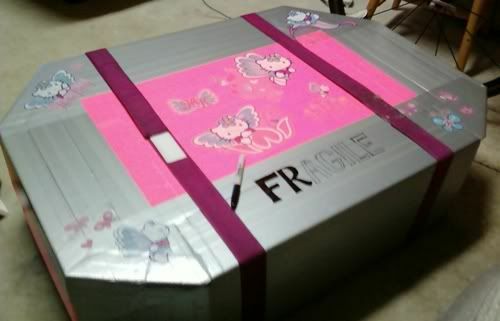 10) You realize in Subic that you should’ve gone with step #7, even though you had thought of it already but dismissed it because you didn’t think duct tape would make the “pretty” clause (you had yet to discover hot pink and purple duct tape at Target). Of course now you realize that your pull buoy looks like a thigh full of cellulite, and dagnabbit, duct tape would’ve been SO MUCH PRETTIER. But before you get the duct tape, you figure you should fill in the craters…maybe that gap-filling stuff for sealing up bathtubs would work. 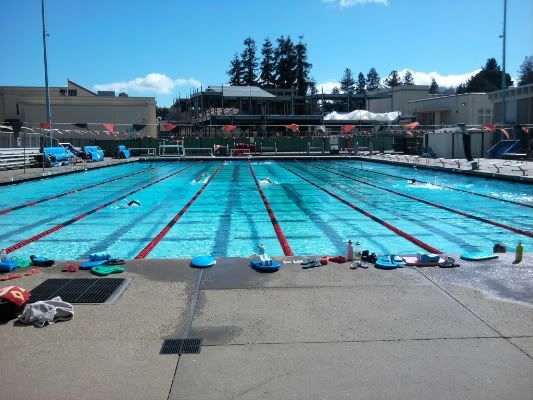 12) Try it out at the pool again! Elite teammates and coach are a little puzzled and intrigued. But it works so much better than that piece o’ crap one you had! 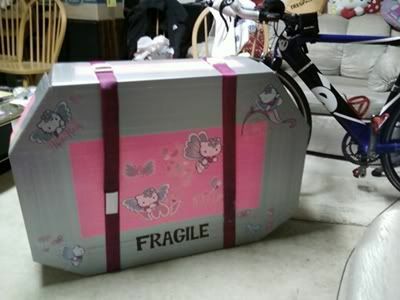 Some people think it looks like smuggled Cuban contraband. Does it work? Well, the foil is a bit slippery in the flip turns and it becomes obvious after a few swims that the “Permanent Marker” is no Sharpie. 13) Add some of this red tape (also from the 88 Mart in Subic) as a middle stripe down the length of the pull buoy. It seems to help keep things between the thighs during flip turns as it is a tad grippier than the foil tape. Excellent! Effing genius! Just like MacGyver, but a little slower! Just a little. Here are recent photos I took of the pull buoy. Guinness is modelling in the background. It lasted in this state quite happily since February, and now it’s June. 14) I decided it was violating the “pretty” clause and was tired of the lifeguards asking me if I left my lunch on deck as I was warming up, so time for a little makeover. 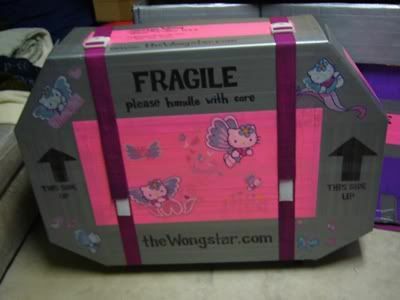 Now it matches my very pretty bike box. Comes complete with motivational slogans for when you can’t bring Coach home with you. 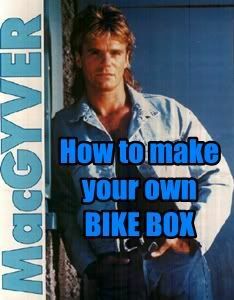 You are currently browsing the archives for the MacGyver series category.